Kerala Technology University Vice Chancellor Kuncheria P. Isaac has stressed the need for frugal innovations that utilise limited resources.Inaugurating the Innovators’ Meet organised by the Kerala Sasthra Sahithya Parishad at the Town Square here on Tuesday, Dr. Isaac pointed out that the country required innovations which “did more and better with less (resources)”.“Creations which catered to specific target groups were much required to spur the economic growth of the country. For instance, agricultural prosperity demanded certain tools that assisted small-scale farmers, particularly due to the fact that most farmers had small holdings. Similarly, industrial growth depended on innovations which were effective and simple. 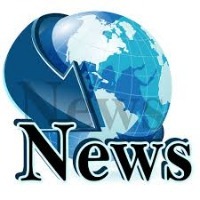 At the same time, high quality must be ensured in products,” he said. He said the State was yet to witness a movement that focused on promoting creativity among developers in various fields. Educational institutions had a vital role to play in inculcating interest among students to develop innovative technologies.Parishad vice president T.P. Sreesankar presided over the function. Alappuzha municipal chairperson Mercy Diana Macido, KSSP activists M. Gopakumar, P.V. Joseph, Deepak Dayanandan, K.M. Tahir and Joy Sebastian also spoke on the occasion.The Kadiroor grama panchayat in Kannur won the top prize at the Clean Innovators’ meet for the waste management technique that has been implemented in the local body. 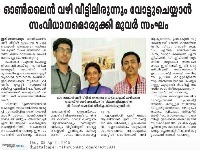 The Kodungallur municipality was selected for a special jury award on the occasion.In the Students’ Innovators’ session, Simon Kurian and Jacob Antony, students of St. Berchmans Higher Secondary School, Changanassery, emerged victorious for their innovative method in simplifying the process of rubber tapping. Aleena Jijy and Siya Sajan came second for devising a technique that replaced the conventional stretchers for carrying patients. A team led by Bibin Cyriac of the Sahrdaya College of Engineering and Technology, Kodakara, finished in the third position.A Classroom Innovators’ meet that highlights methods undertaken by local bodies and parent-teacher associations in strengthening the academic system will be held on Wednesday. Riswan Sheriff, Shilpa & Kiran, (3rd year B.Tech Students) have developed an Online voting Software which helps people to vote from home. 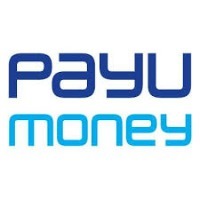 From 01/04/2015 onwards all fee payments can be done through online payment only. The National Assessment and Accreditation Council (NAAC) is an organization that assesses and accredits institutions of higher education in India. It is an authonomous body of University Grants Commission of Govenment of India.The three-member NAAC Peer Team comprising Prof K E Raman, Director BITS, Prof. S Swaminathan, Dean and Director CenTAB and Prof. Ashuthosh Trivedi , DTU Dean of Technology, visited Sahrdaya Campus on 12, 13 and 14 February 2015. They assessed the curricular, co-curricular and extra curricular activities of the college. On 14th february 2015, in the exit meeting , Chairman of the team briefed the summary of the visit and handed over the exit report to Dr. Sudha George Valavi , Principal.The 5th meeting of the standing committee (3rd March 2015) recommended for Accreditation by NAAC to Sahrdaya College of Engineering and Technology for 5years from 3rd March 2015. At present Sahrdaya is the only Engineering College in University of Calicut with NAAC accreditation. Today we have arranged the formal Inauguration of IEDC-Boot Camp and the research centre at 11:00 am in the auditorium. All staff and students are requested to be present on the occasion .The regular class work is suspended from 11:00 am to 1:00 pm. 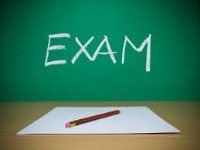 The 7th sem University exam of CS & EEE. In CS -702 and EEE-702 respectively conducted on 24-11-2014 is cancelled and the Re-exam in the above subject will be conducted on 6th March 2015 from 2:00pm to 5:00pm. A three-member Peer Team comprising Director BITS, Dean and Director CenTAB and DTU Dean of Technology, appointed by Union HRD Ministry’s national assessment and accreditation body for higher education institutions visited for validation to the college on 12, 13 and 14 February 2015. 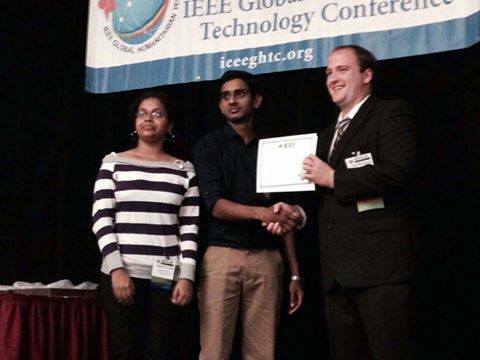 Congratulations to Keerthi S Iyer and John J Padamadan who Won the Third Prize in Project Paper Presentation in the IEEE-GHTC-2014 at California-USA. 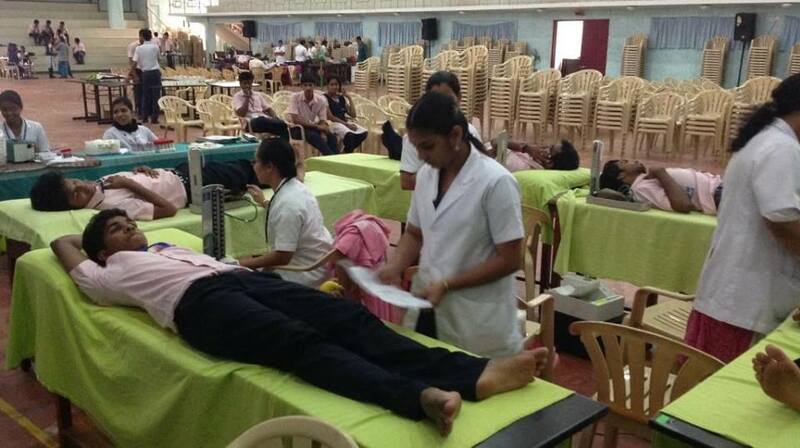 Blood Donation camp conducted by NSS Unit of Sahrdaya college of Engineering and Technology.More than Hundred students Donated their Blood in this camp.We conducted this camp with the help of IMA Blood Bank & Jubilee Mission Hospital Thrissur.